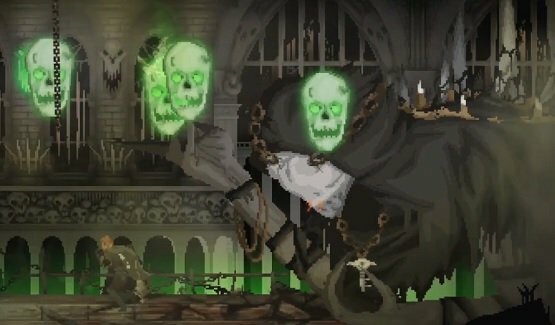 Dark Devotion is a new side-scrolling action / RPG from developer Hibernian Workshop, and publisher The Arcade Crew (who is also publishing the amazing retro shooter Blazing Chrome). If you love exploring vast, sprawling maps, tough-as-nails combat, a Gothic aesthetic, and terrifying bosses, you’re going to love Dark Devotion when it launches on PS4, Switch, and PC soon. We don’t have an exact release date, but we know it’s coming in early 2019. As you can see, this game is drawing a lot of comparisons to Dead Cells and Castlevania, and those are two excellent games to be compared to. Like Dead Cells, Dark Devotion is a roguelike, which means when you die, you lose everything. Your experience stays with you though, so you’re going to get stronger with every run. You can also unlock new weapons and items to potentially spawn when you revive, which could make the next run a bit easier. Unlike Dead Cells, the map in Dark Devotion is hand-crafted, instead of procedurally generated. This makes it a bit more like a Metroidvania, which will be very welcome news for those of you who love to explore and learn maps over time. We should have a release date for Dark Devotion very soon, so stay tuned!